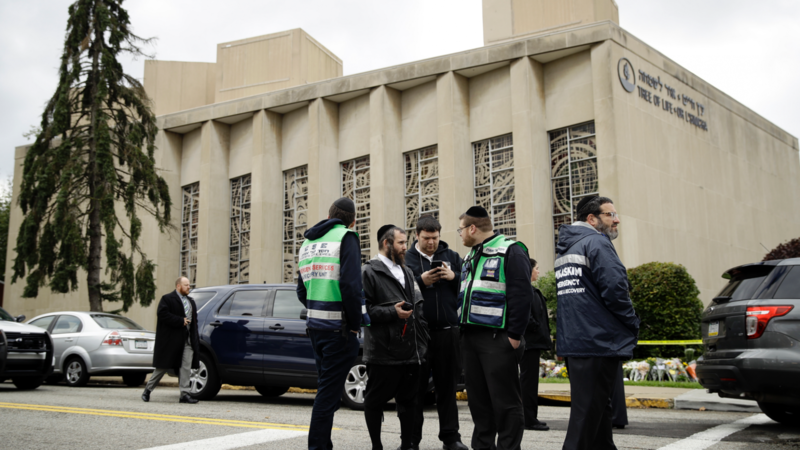 The attack on a synagogue on the Sabbath of October 27th was the worst anti-semitic incident in American history. Similar incidents have taken place throughout history in many countries. When I was a child growing up in England, I remember going on a school field trip to the city of York. At the time, I must have been 9 or 10 years of age. The old Roman city of York is one of the most interesting cities in England. It was here that Constantine was proclaimed Emperor in 306 AD. Constantine later converted to Catholicism, turning away from worship of the pagan gods. The writer, James Carroll, a former Catholic priest, traced anti-Semitism back to Constantine in his book “Constantine’s Sword.” It was all quite simple – the Jews killed Christ, so they should be persecuted forever. This has been the teaching of the church down through the centuries. Four years after William the Conqueror successfully invaded England in 1066, he invited Jews from France to come over. He believed that their commercial skills and capital would help develop the English economy. The Jews were not allowed to purchase land (most English people could not, either), but they were allowed to practice medicine and money-lending, the latter breeding resentment against the Jews. In 1189, following a rumor that the newly crowned King Richard I had ordered a massacre of Jews, mobs in a number of cities across the country attacked and killed Jews. The worst incident was in the city of York the following year, just before the Passover. “A significant loss of life occurred at York on the night of March 16 (Shabbat HaGadol, the Shabbat before Passover) and 17 March 1190. As crusaders prepared to leave on the Third Crusade, religious fervor resulted in several anti-Jewish violences. Josce, the leader of the Jews in York, asked the warden of York Castle to receive them with their wives and children, and they were accepted into Clifford’s Tower. However, the tower was besieged by the mob of crusaders, demanding that the Jews convert to Christianity and be baptized. Trapped in the castle, the Jews were advised by their religious leader, Rabbi Yomtov of Joigney, to kill themselves rather than convert; Josce began by slaying his wife Anna and his two children, and then was killed by Yomtov. The father of each family killed his wife and children, before Yomtov and Josce set fire to the wooden keep, killing themselves. The handful of Jews who did not kill themselves died in the fire, or were murdered by rioters.” (Wikipedia: History of the Jews in England 1066-1290). Clearly, upon hearing a rumor, the crowds were ready to turn against the Jews. It should be realized that many of those in the crowd would likely have owed money to the Jewish money-lenders and this was an opportunity to cancel the debts. Debts to Jewish money-lenders continued to be an issue and not just in England. “On 15 July 1205, the pope laid down the principle that Jews were doomed to perpetual servitude because they had crucified Jesus. I n England the secular power soon followed the initiative of the Church. John, having become indebted to the Jewish community while in Ireland, at first treated Jews with a show of forbearance. He confirmed the charter of Rabbi Josce and his sons, and made it apply to all the Jews of England; he wrote a sharp remonstrance to the mayor of London against the attacks that were continually being made upon the Jews of that city, alone of all the cities of England. He reappointed one Jacob archpriest of all the English Jews (12 July,1199). In 1492 Queen Isabella of Spain desired to make her country completely Catholic. This followed the expulsion of the Muslims who had dominated the country for centuries. The new law meant that Jews had to convert, emigrate or be burned to death. Many fled to Poland, which was then the most liberal country in Europe. During a tour of Krakow some years ago, we were able to see a number of synagogues in the old Jewish Quarter of the medieval city. Our tour guide related the persecution of Jews in Spain and how many moved to Krakow. Two years later, the local people turned against them. I asked our Polish guide why. His response was interesting. “The Jews were different. They had different customs. They went to church on a different day….” Sabbath observance has always made religious Jews more noticeable wherever they have settled. Polish persecution of Jews had started prior to the arrival of the Spanish Jews. It continued on and off into modern times, with a pogrom immediately after the defeat of the Nazis and the arrival of the Soviets in 1945. This article only touches the surface where anti-semitism is concerned. The incidents I related from England are what I learned as a child; I mention Krakow as my visit there was a great learning experience. Auschwitz is close to Krakow. A visit there was truly traumatic for me personally. It was bad enough standing in the gas chambers and looking up at the holes in the ceiling that enabled Zykon B to be dropped down amongst those taking a “shower.” I felt like throwing up when I saw the “accommodations” for inmates – bunk-beds three levels high – people would fight to get the top bunk, so that they would not get “showered on” during the night when those above had to relieve themselves. (Inmates had permanent diarrhoea because the scarce food was so bad.) But, what made me “lose it” was the exhibit behind a glass screen, of the hair of little girls taken (after being gassed) from Jewish children and then used to make wigs and other things. All I could think of was our little girls, our grandchildren when they were 3 or 4. I had to leave the room. I had planned on giving a sermon on anti-semitism when I returned to Michigan, but I could not bring myself to give it. I knew I could not get through the sermon without, once again, losing it. On another occasion, following a visit to Anne Frank’s House, I wanted to speak on it but couldn’t. When I looked out the back window of the house at the backyard below, it reminded me so much of my grandparents’ home. If it could happen here, it might have happened in England; or anywhere else, for that matter. We are naïve if we think it can never happen here. As if the Holocaust wasn’t bad enough, hundreds of millions of people around the world have learned nothing from it. They still hate Jews. They still blame Jewish bankers when they can’t repay a loan. Many still think they deserve what they get because they killed Christ when the scriptures make it clear that every single one of us killed Christ. Note I John 2:2: “And Christ himself is the means by which our sins are forgiven, and not our sins only, but also the sins of everyone.” (Good News Translation). The Contemporary English Version translates the verse this way: “Christ is the sacrifice that takes away our sins and the sins of all the world’s people.” He had to die so that each of us, individually, may receive eternal life. Jesus Christ Himself was a Jew; so was the Apostle John who wrote those words. Complicating the issue of anti-Semitism today is the existence of the modern state of Israel, a nation that came into being exactly 70 years ago. The Palestinians lost their land and have hated Israel ever since. Many Muslims also hate Israel in sympathy with the Palestinians. This hatred of Israel has infected others, partly because of television newsreels showing the suffering of the Palestinian people. The British Labor Party, under the leadership of Jeremy Corbyn, has a bad record of anti-Semitism. Fifty years ago, there were fifty Jewish members of parliament, 48 of whom were members of the Labor Party. Clearly, attitudes have changed. Modern Israel is, without a doubt, the most successful country in the Middle East. It is the only western-style democracy. This Jewish country allows freedom of religion in a region where non-Muslims are suffering from great persecution. The nation can teach its neighbors lots of lessons, about economic development, freedom and democracy. I had the privilege of being able to spend a summer in the country in 1973 and was greatly impressed at the development that had taken place in just 25 years. I would love to go back and see how much further the country has progressed, in spite of wars and internal conflict. People should remember what God said to Abraham thousands of years ago. No country benefits from anti-Semitism. Let’s hope and pray it remains an isolated incident in American history. In a report on BBC World News America, polls showed the divide was between “big cities and suburbs” and those living in rural areas, which includes small-town America. Reports on the election are usually quite superficial. Not realized is that the white blue-collar workers are the primary producers of the nation’s wealth; the people with college degrees are in non-productive jobs. Left-wing protestors across the country are chanting “Yes, we can” in opposition to the president’s stance on illegal immigration. But few, if any, remember who first used this expression. Tucker Carlson showed a few days ago that it was Cesar Chavez, the (Hispanic) United Farm Workers Union president who was very left-wing and, yes, against illegal immigration. “Yes, we can SEAL THE BORDERS,” was the original chant. Mr. Chavez, concerned for the members of his union, realized that illegals would only force down wages, making things harder for those at the lower end of the income spectrum. The last thing he wanted was more Mexicans in the country. It’s ironic that the Democrats have ended up supporting illegals. It was not always thus. When the boat people started arriving from Vietnam 40 years ago, California’s Democratic Governor Jerry Brown did not want them in his state, which was already finding it difficult to cope with poverty and unemployment. Today, Jerry Brown encourages more immigration. Because it’s now known that 90% of illegals vote for the Democrats once they become registered voters. These columns favor generous immigration and asylum for refugees. But when migration becomes a political weapon to foment border chaos, leaders have no choice other than to step in and protect national security. Exhibit A are the 4,000 or so Central Americans moving on foot through Mexico to the U.S. Waves of humanity marching in lock step don’t materialize spontaneously and neither has this “caravan.” This march is organized and not necessarily for the benefit of the migrants. Mr. Trump has good reason to turn it back. One of the best books I’ve read recently was “Sword and Scimitar” by Raymond Ibrahim. It’s a new book that looks at the history of the 1,400-year-old struggle between Islam and the West, which continues to this day. Having discussed the doctrine of jihad and its motivations at some length (see Introduction) here it is necessary to compare and contrast the motivations behind the crusades. Shocking as it may seem, love – not of the modern, sentimental variety, but a medieval, muscular one, characterized by Christian altruism, agape – was the primary driving force behind the crusade. As foremost crusade historian Jonathan Riley-Smith puts it, the crusaders, moved by love of God and their neighbor, renouncing wives, children, and earthly possessions, and adopting temporary poverty and chastity, were described as going into a voluntary exile. “It was a miraculous sight,” wrote one contemporary. “Everyone bought high and sold low; whatever could be used on the journey was expensive, since they were in a hurry; they sold cheaply whatever items of value they had piled up; what neither prison nor torture could have wrung from them just a short time before they now sold for a few paltry coins.” But it was worth it all for the “message was clear,” writes Thomas Madden: “Christ was crucified again in the persecution of his faithful and the defilement of his sanctuaries.” Both needed rescuing; both offered an opportunity to fulfill one of Christ’s two greatest commandments: “Love God with all your heart” and “love your neighbor as yourself” (Luke 10:27). The central banks of the UK and Australia have both raised red flags about the rapid expansion of so-called leveraged loans and associated products that have invited comparisons to the toxic debt vehicles that triggered the global financial crisis. In documents published just days apart, both the Reserve Bank of Australia and the Bank of England have expressed clear concern at the growth in leveraged loans, which have doubled in issuance since the GFC and now stand at over $US1 trillion ($1.4 trillion). “Immerse yourself in the pro-immigration literature of Democratic Party thinkers, and you will notice a curious pattern of argument: High levels of immigration have awakened the racism and bigotry that have fueled the rise of right-wing populism, but it is nevertheless best to press forward with the policies that have ostensibly produced this fearsome reaction. Why? Because slowing the pace of immigration would be a callow surrender to bigotry. But also because, in the fullness of time, a unified coalition of college-educated white liberals, African Americans, and working class immigrants and their descendants will vanquish the aging rump of reactionary whites.” (“The next populist revolution,” by Reihan Salam, The Atlantic Monthly, September 2018).